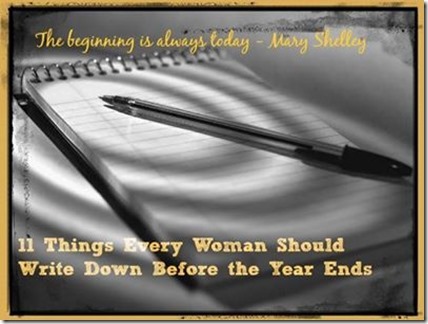 11 Things Every Woman Should Write Down Before the Year Ends - A Rose Is A Rose Is A Rose! Corinne, our wonderful friend, shared this empowering post with us, from Oprah which talks about the 11 Things Every Woman Should Write Down Before the Year Ends. I am list person, so sharing my story in this format appealed to me. When the lovely and vivacious Richa tagged me in her post, I knew I had to list my 11 things before the year ends, too. The post on Oprah’s site says, there’s no better way to celebrate the rich, full life you’ve lived so far—and the big, bright future ahead—than telling your story. I so agree with this, after all, life can only be understood backwards, in order to be lived forward. I believe, the thing that younger me would approve of the present me is having learnt to ‘let go’. The journey to accept the things that I cant change and not getting too worked up over issues, has not been an easy one but then no exploration in life ever is. Over the years, I have learnt that if I cant change the thing I don’t like, changing my attitude about it is certainly better. I last book that I read was ‘Aisle be Damned’ by Rishi Piparaiya. I usually don’t read non-fiction, but then I push myself to read it from time to time. And I am so glad that I read this one. ‘Aisle be Damned’ is a comical account of what to do and what not to do when travelling by air. I am currently reading ‘The Almond Tree’ by Michelle Cohen Corasanti which is a brilliantly written novel. The story is about the Israeli-Palestinian conflict and reads like Khaled Hosseini’s ‘The Kite Runner’. You get hit the hardest when the people you trust and love betray and run away when you are faced with life’s trials and tribulations. Having experienced this from close quarters, I want to be there for my family and friends, when they need me, no matter how big or small their problem is, no matter how deep I am in my own troubles. It is definitely Tees and Denims. In fact, 99% 98% of the time, I am seen wearing these only. I guess, my life is fairly an open book for the people who matter to me. So, ‘a deep, dark – shhh – secret’… I guess, it is non-existent! And realizing this makes my inner life a bit more brighter and peaceful. I knew, I wasn’t doing great at that moment but in an instant I felt more confident, more self-assured… and incredibly motivated. Remembering this unexpected compliment at the most unexpected time, lights up my day, always. Whatever goes around comes around. So keep your circle positive. When I meet friends and acquaintances, usually, I have to explain what a blog is and why I blog etc etc. Recently, there was this Diwali get-together in our apartment complex. Now, usually, I meet my neighbours only in the lifts or corridors, when I am either going out or getting back in. So, there was this lady, who was ‘complaining’ about my absence in their daily evening get-togethers. So, another lady whose son is Aaryan’s friend, replied before I could respond, “She is very busy. She has a blog and writes so well.” I was pleasantly surprised as I had never spoken about my blog with her. She then shared about some of the blog posts she enjoyed. Needless to say that I was on cloud 9. She revealed that Aaryan had once told her about my blog, so she searched my blog and has been a silent but active reader since then. That moment when the maids have gone, the boys are at their respective work places, the last of the chore has been done, the home looks spotlessly clean and all things are in place, my ‘Me Time’ of few minutes, before I lock the door and go out myself for work – sitting in my favourite corner with laptop or a book or sitting idle just like that and a hot mug of tea… total bliss… my best part of the day… my little island of solitude in a day. A bad phase in business was the bestest teacher. It made me realize that real things do come out from fake friends… real lessons. My Bucket List looks great as of now. Only amendment I must do is that I must prioritize certain things from the long list. And learning to bake should be in the forefront. Though my interest in regular cooking is waning at a brisk pace, baking cakes and muffins is something that I am very keen to explore and experiment. I am so glad that I listed these 11 things… gave me a kind of fresh and new perspective on where I was, where I am now and where I plan to go. Filled me with so much of determination and optimism. 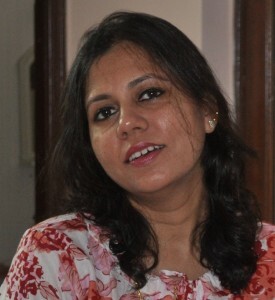 Compassionate and creative, Vidya spearheaded this series and is the first in the chain. 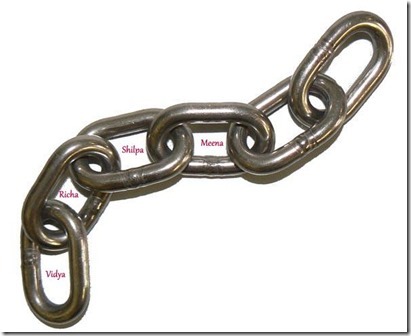 She then added dear Richa who then made me the 3rd link in the chain. I now pass on this to dear friend, the bubbly and wonderful Meena. 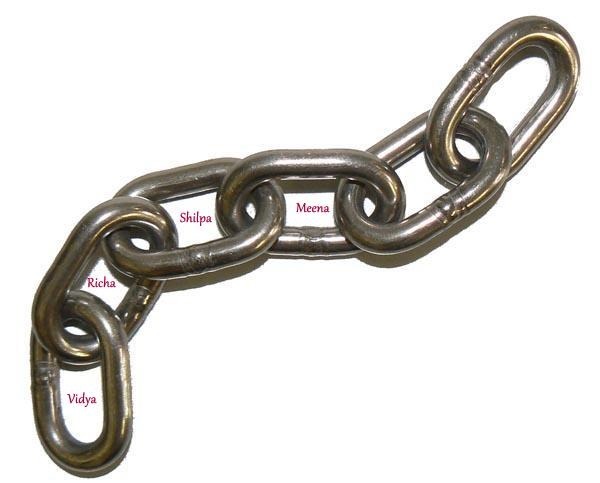 So, over to you Meena, go ahead and share your life and extend this chain of love. Oh yes, I so enjoyed writing this post! Sort of time travel from past to present to future! Meena’s post is live now, do check her 11 things too! Lovely list, Shilpa! I read Vidya’s spectacular post today on this. What a beautiful list this is. Loved the unexpected compliment incident the most. That was touching! And absolutely agree with your favorite quote as well! Wish you love and luck in the New Year! Loved reading this list, Shilpa! Liked the ‘You are doing great” compliment that you received. I liked the part where you have written: “You get hit the hardest when the people you trust and love betray and run away when you are faced with life’s trials and tribulations. Having experienced this from close quarters, I want to be there for my family and friends, when they need me, no matter how big or small their problem is, no matter how deep I am in my own troubles.” That is so TRUE and aptly said! Thanks a lot Swapna. Glad that you liked reading these 11 things and also that you relate to being there for family and friends in their times of troubles! Good List, Shilpa ji 🙂 Superb way to end the year !! Gives us an insight into your personality, as well ! Beautiful post.. Loved the compliment you got. Great list. Wishing you and your family a very happy new year. Have a blast. I can so relate to you. Full time working and then blogging leaves me with no social space. And often I have to be the subject of taunts from people with respect to my absence especially from society gatherings. And then in such moments if someone comes out in full support of you and also accept how much they enjoy your blog is an amazing thing! Off late there has been a lot of discussion on what and what not to do in an aeroplane when with kids, your story might be a great eye opener to many people. Oh yes, the feeling and the knowledge that somebody is reading you without you knowing about it is, priceless!! Love such moments! Ohk… am not aware of the do’s and dont’s now for toddlers in a flight. The incident that I mentioned happened in 2002! Oh another lovely read, Shilpa! I’m loving this series. It’s amazing how our blogs are read quietly by non-bloggers and I often think of them when I write. It’s to them that our writing seems to matter the most, don’t you think? About the compliment you received, I guess that person has forgotten the incident – but the ripples of kindness continue – makes one conscious of doing thoughtful little things for people. Beautiful! I am going to make this post on my blog too! There is so much to write! Loved the list — thought about each one as I read them. Especially loved the compliment — those kind are always the most unexpected and appreciated. Loved your list Shilpa. I liked the point you mentioned above that if we can’t change a thing we don’t like we can change our attitude towards it and that would make us feel much better. Loved this point the most. Thanks Diana. Glad you enjoyed this list! Somebody said, when we are no longer able to change a situation – we are challenged to change ourselves… and that’s the best strategy to adopt! Point 3 … totally totally agree (having faced this myself). Great reading indeed Shilpa! Hope the New Year rings in even more happiness! I believe in point 7 too. Shilpa it’s awesome. Loved reading it. Especially the episode on your compliment was touching. Shilpa, I love how diligently u do the post – but my takeaway definitely has to be the bit abt letting go – something I hv to consciously work on. I agree wholeheartedly with that quote,Shilpa! Loved your list. Oprah is always inspiring, I am a great fan of her shows. I really miss watching her shows everyday. I also like the way you challenge yourself. Be happy and spread happiness too. That was a wonderful list.. Loved the compliment you got.. something like that sounds sooo good when you’re low. And the next happy thing.. someone unexpected reading your blog… what a feeling that is. Lovely! I’m heading here right after reading Richa’s blog and I’m going to say the same thing. I find a lot of similarities. Only then when I read all your answers again, the core of certain things are similar for most of us. Be it about the quote, or what the younger person in you would like about the present you. It’s also a nice chance to get to know you 🙂 Wish I could also write about it. Shilpa I must say you are AWESOME. You do things in a very systematic way.Every project that you take up is completed with great finesse. My best wishes for the New Year for you, K and Aryan. God bless you. BTW,I am inspired by you and will write eleven things I will do. Great things to write about. Loved the compliments you received from your co passenger and from Aryan’s friend’s mom. Wish you a very happy new year. Shilpa,the way and the speed at which are moving,day is not far when you will get international recognition as a blogger……please don’t forget your present friends then. Loved the compilation Shilpa, writing down lists like these give us fresher and surprising insights into ourselves. When are you writing yours? ?